Ohio State Highway Patrol provided an update to information about a Tuesday afternoon crash on U.S. 35 Tuesday. The driver of a westbound maroon sedan that collided with an eastbound semi a few miles from the State Route 160 intersection with US 35 and caused a five-vehicle collision, was medically evacuated by chopper to Cabell Huntington Hospital, W.Va., according to Lt. Max Norris, commander of the Gallipolis Post of the OSHP. Suffering from broken bones and bruising, the individual is reportedly stable. Two other individuals Norris reported as stable after being transported to the nearby Holzer Health System. 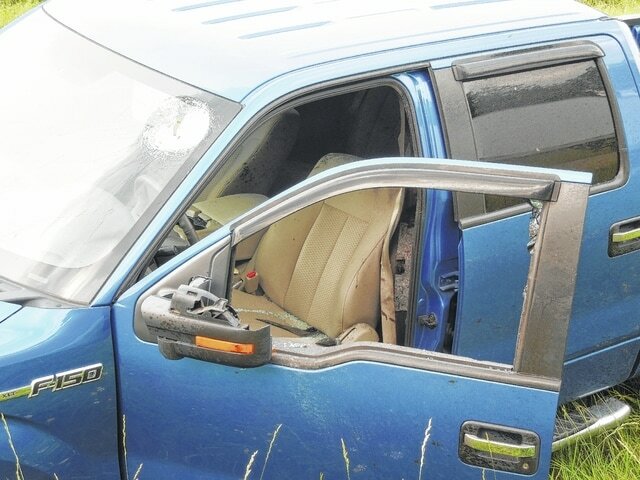 The driver of the pictured pickup truck was notably fortunate as a battery reportedly flew through his driver’s side window, destroying the headrest of his seat, but leaving the individual suffering non-life-threatening injuries. The battery was supposedly launched from the collision with the maroon sedan. Norris said OSHP officers were pleased that everyone involved survived.